In January 1992, a container with yellow duckies and other bath toys fell from a cargo ship in a heavy storm. The container opened in the accident, and the contents spilled out into the Pacific. Cargo ships lose a few hundred containers at sea every year. The containers usually sink, and the contents end up on the bottom of the ocean. These bath toys, however, were made to float – and float they did. In November 1992, a beachcomber in Alaska found the first toys. 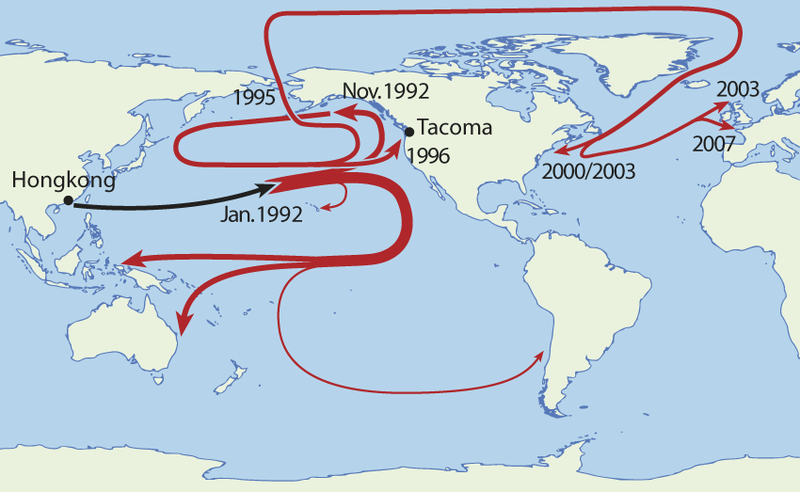 Oceanographer Curtis Ebbesmeyer used this information to figure out the ocean current that brought the ducks from the site of the storm at sea all the way to the Alaskan coast, 2000 miles away. Over the next few months, more toys were found along the Alaskan coast, adding to Ebbesmeyer’s data set. After floating past Alaska, some of the duckies turned around and moved toward Russia, while others floated northward, through the Bering Straight. In 1994, some of the toys got stuck in ice in the Arctic. In 1997, to add to the toys floating around the oceans, a container with Lego figures fell off another cargo ship off the coast of England. This batch of toys was much closer to land, and many of the Lego pieces were found on a beach in Cornwall. Most sightings of the Lego pieces have come from England and Wales, but there is also one suspected find in Australia. For the duckies, getting stuck in Arctic ice would have been the end of their journey, were it not for climate change. After almost ten years, the ice melted enough for some of the ducks to escape the Artic region, and in 2003 one of the toys was found in the Hebrides, in Northern Scotland. At the moment, there are probably still a few of the initial batch of bath toys left, floating somewhere along the world’s ocean currents. This entry was posted in Have Science Will Travel, Song of the Week and tagged bath toys, geography, rubber ducky, sea. Bookmark the permalink.